Theories about “Us” began as soon as the official trailer dropped in late December. “Us” is a completely different movie from “Get Out” which is something audience goers should keep in mind. It isn’t as good or as groundbreaking as “Get Out,” it’s more of a standard horror film. “Get Out” is a slow burn. While the actions of the white people at the Armitage estate are scary, creepy, and uncomfortable throughout the film, the blood and gore don’t really start until Rose (Allison Williams) says chillingly on the stairs, “You know I can’t give you the keys, right babe?” and Chris (Daniel Kaluuya) realizes he’s going to have to kill every member of this family of psychopaths if he wants to get out alive. In “Us,” the blood and killing begin earlier in the film. At the beginning of the movie, we see a young girl named Adelaide (Madison Curry) wander away from her dad on the Santa Cruz boardwalk, and enter a funhouse with arrow reading “Find Yourself” pointing to the dark entrance. While she’s in there, the power goes out and she encounters a young girl that looks just like her. It’s not a reflection in the funhouse mirror; it’s her dopplegãnger. Adelaide is traumatized by this occurrence. When the story shifts to present day, it centers around the Wilson family, including adult Adelaide (Lupita Nyong’o), her husband Gabe (Winston Duke) and their children, Zora (Shahadi Wright Joseph) and Jason (Evan Alex). They’re going to vacation in their family beach house near Santa Cruz. Adelaide seems happy and relaxed, until Gabe brings up going to the Santa Cruz boardwalk. Not wanting to revisit the site of a major childhood trauma, Adelaide at first doesn’t want to go, but she eventually relents. The Wilsons head to the beach, and Jason wanders off, which scares Adelaide. Back at the house that night, Adelaide tells Gabe about her childhood encounter with her dopplegänger in the funhouse and says she’s always felt like the other girl would come after her. Shortly after this conversation, the power goes out. Then a family shows up outside of the Wilson’s house. They come face-to-face with their dopplegängers, clad in red jumpsuits. The dopplegãngers, or “Tethers”, are clones who live below the earth’s surface (the beginning of the film reminds us that there are thousands of miles of abandoned tunnels underneath the U.S., from unused subway tunnels and old mine shafts). The shadow people are “tethered” to their above ground counterparts, and must do whatever their counterparts do. As Adelaide’s counterpart, Red, points out, it doesn’t matter that she didn’t love Abraham (Gabe’s tether), she had to marry him anyway because of Adelaide’s choice. Where “Get Out” took on racism, particularly of the white liberal variety, “Us” takes on classism. And it shows just to what lengths people are willing to go to to keep their life and status in check, even if they’re aware of the suffering of others. The Wilsons are clearly middle to upper middle class people. After meeting up with their friends, Josh and Kitty Tyler (played by Tim Heidecker and Elisabeth Moss), Gabe complains about Josh getting a new car just to get to him. There are plot holes in “Us” that may frustrate some viewers, though I’ve found them fascinating. I’m not sure we’re supposed to have all the answers; I think this movie is designed to make you think. The acting is incredible across the board. Lupita Nyong’o is getting a ton of well-deserved hype for her performance. The ease with which she goes from terrified mother to a hoarse, crazy-eyed woman with an evil laugh is truly impressive. The rest of the cast deserve credit as well. Winston Duke is great as the dorky, lovable dad (complete with Dad-jokes) in the film. The actors who play the Wilson children–Shahadi Wright Joseph and Evan Alex–both turn in excellent and creepy performances. Alex’s characters–Jason Wilson and Pluto–are perhaps the most mysterious ones in the movie. Wright Joseph is perfection, seamlessly going from typical American teenager to creepy as hell on a dime. Zora’s dopplegänger, Umbrae, wears a chilling smile that could frighten anyone. Moss and Heidecker are great as the bitchy, bickering, basic white friends of the Wilson’s. I don’t want to go into too many other details, but I will note some things to keep an eye out for and things I thought were interesting in this dopplegänger tale. “Us” being used as the title works in several ways. There’s the whole “Us vs. Them” idea, and the idea that “Us” equals U.S., which is intentional, according to Peele’s comments. It’s not hard to see how relevant that is today. The white rabbit at the beginning of the film immediately brought “Alice in Wonderland” and the idea that we were following Jordan Peele down the rabbit hole. One of the movie posters for “Us” features a pair of hands holding gold scissors–the weapon of choice for the Tethers. Two symmetrical blades, working together, with the sole purpose to divide things. The reference to Hands Across America was interesting as were the visuals of a chain of people clad in red jumpsuits stretching across the land, literally dividing the country in half. Young Adelaide sees a commercial for it in 1986, at the very beginning of the movie. Some of the murders are committed by boat and by golf club–two symbols of an upper class existence. The song that plays during the scene in the car, “I Got 5 on It” by Luniz, is about drugs (despite Gabe’s objection in the film). It’s about splitting the cost of a dimebag. “I Got 5 on It” means putting in $5 towards it. Peele said it was an easy choice, with the movie being set in Northern California and Luniz being from Oakland, he also said the song had a haunting quality. The original definitely does, and now it’s even creepier, thanks to “Tethered Remix” done for the movie. While Peele chose “I Got 5 on It” for the reasons above, there’s also a weird twist that fits in with the movie. The man who sings the hook, Michael Marshall, is practically forgotten and hasn’t seen any money from it. Speaking of “I’ve Got 5 on It,” one thing that stood out to me when I saw the trailer originally was the character of Adelaide saying ” get in the rhythm,” yet snapping her fingers on the 1 & 3 instead on 2 & 4. In the same scene in the car, Jason is wearing a “Jaws” raglan. A nod to another horror classic where the danger is coming from beneath the surface. I also couldn’t help but think of both “Jaws” and “Cape Fear” during the scenes on the water. When the Wilsons first arrive at their house–which sits right on a body of water that isn’t the ocean–Gabe tells Adelaide he wants to go to the beach at Santa Cruz. Wanting to avoid the place where she was traumatized as a child, she says “we have a beach right here” and Gabe says something about it not being a real beach, since it’s just on the bay and he wants to go the boardwalk. This intrigued me. 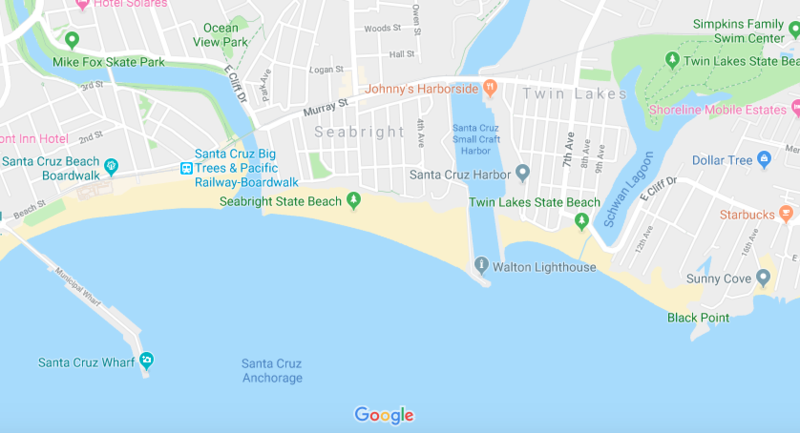 My husband and I visited Santa Cruz on our honeymoon, so I looked up a map to figure out in what area the Wilsons were staying. I think I found the answer–Twin Lakes, which is about two miles from the Santa Cruz boardwalk. When young Adelaide is in Santa Cruz with her parents in 1986, her mother says to her father, “they’re shooting a movie here, you should see if they need any extras.” The 1987 classic “The Lost Boys” was set in the fictional town of Santa Carla, but was filmed in Santa Cruz, with its boardwalk being used for many scenes in the film. Of course Peele designed it that way. One way “Us” does remind me of “Get Out”–I haven’t stopped thinking about it since I left the theater.